It could be first Hec Crighton Trophy race that was decided by Wi-Fi. Not that it will have any effect on the outdated method of picking the honouree. Western's Michael Faulds likely is the OUA's nominee over Queen's Dan Brannagan after becoming the all-time leader with a 550-yard day in the Mustangs' possibly Pyrrhic 47-0 win in Toronto. Both their teams had people checking live stats of the other guy's game (what do you know, having an up-to-date website in 2009 is a good idea!). When Brannagan, who threw for 289 yards at Laurier, briefly came out, so Faulds down in London. Brannagan returned, Faulds returned. Faulds came out five minutes into the final quarter, having pushed his total to 10,811 yards. Brannagan ending up sitting on 10,714 as his backup mopped up in Queen's meaningless-for-them 25-13 loss at Laurier. It was a reversal from starting his day digesting the Toronto Star's reference to his "shoo-in Hec Crighton Award nomination" over breakfast and being presented with the ball early in the first quarter after he passed Matt Connell's mark. It also pointed out the way the honour is handled has not kept up with how people are following CIS football. It's 2009 and people will debate this till the cows home, but it's going to be treated like it's still 1980 and it's a one-off, one-day story. No debate, no nothing. Each conference announces its nominee, then it gets handed out two days before the Vanier Cup. It fits in with how Canadian Interuniversity Sport should be looking at how other niche leagues do a great service to fans by being a leader in online content and interactivity. The NHL figured this out, so has MLS. Why can't the journalists who vote in the University Football Reporters of Canada poll, coaches and perhaps pro scouts and former winners vote for the Hec? As far as the Hec debate goes, the end-of-story is going to be that Faulds has the counting stats with a CIS-record 3,033 passing yards (breaking the mark of 3,001 Queen's Tom Denison set in 2002) combined with his rep forged in two Yates Cups and one Mitchell Bowl victory. He has a good Hec application in any season from a coach's point of view. Trouble is, the OUA announces its nominee before the Yates Cup and someone cannot be an anything of the year in a CIS sport unless he/she was already won the honour at the league level. How can you hold Brannagan not having that championship cachet against him when he could still help his team win one? One of the two will not be a finalist, while the AUS is grasping for someone to nominate (presumably Mount Allison wideout Gary Ross, who's great on a winless team). It's just how it's done. It keeps it easy, but what's good for administrators isn't necessarily good for drawing eyeballs to a niche league. Here you have the country's largest newspaper calling one player a "shoo-in," someone who plays for an archrival team topping him and it might not even be a story come Monday. That's Canada for you. The OUA making the choice before the league final is doubly bad when it's tied with the one-nominee-per-conference rule, which has been irksome for a long time. If the nominee's team gets knocked out, then the other player has no chance to build his case. It's also good to foment debate. This stuff is overdone in the U.S., but the debates over the Heisman Trophy which still rage years after the fact. You can probably still find an Arkansas fan who will argue Darren McFadden should have got it over Florida's Tim Tebow in 2007. During the Tennessee-Alabama game today on CBS, Verne Lundquist referred to Michigan's Charles Woodson winning over Peyton Manning in 1997 as "still controversial." It would be great fun to hype up the honour, stretch the debate out all the way to Vanier Cup week. This point has been made before, but there is a lot of appeal to the way American college hockey does it with the Hobey Baker and Patty Kazmaier awards. They name 10 candidates, cut it down to three finalists and award it at the Frozen Four. You have people who will argue the merits of Brannagan, Faulds and Calgary's Erik Glavic all night long, why not fan those flames? People want to have that conversation. It's past time for those in charge to listen. Figuring out which QB was more proficient probably falls under Pettapiece's province. As far as OUA stats may be trusted in terms of accuracy, context and competition, Faulds passed for 3,033 yards (9.78 per attempt) playing a full schedule, although he was lifted early in a blowout vs. York. Brannagan threw for 2,580 (9.21 per attempt) in what amounted to 6½ games. Faulds put up 550 yards vs. U of T, which Queen's did not play. Western did not face Waterloo and Brannagan had 358 yards vs. the Warriors. Between the two, Brannagan had the higher touchdown rate (5.4% to 4.8%) and lower interception rate (2.5% to 2.9%) and was statistically the toughest QB to sack in the OUA (only five times, once per 56 pass attempts), while Faulds had the most yards lost due to sacks (16 for 134 yards). At the same time, Faulds had a tougher strength-of-schedule. He passed less vs. York and Windsor and played four quarters vs. Ottawa to Brannagan's none. That probably tips the pendulum back to him. Any arguments about Western coach Greg Marshall leaving Faulds in against a U of T team which was clearly incapable of scoring points are moot. All of that comes out in the wash. Queen's was in that situation in its final game in 2007 vs. U of T and Rob Bagg had 341 receiving yards, so there's precedent. All that being said, it was some good drama for an afternoon. It will be argued for some time, which believe it or not is good. A lot better than making it easy for administrators. Nice column Sager. The last couple of season with Faulds, Brannagan, Dunk, Sacobie, Quinlan, and Sinopoli have really been high times for the OUA. At a time when the CFL has lamented its lack of "special" QBs the OUA has enjoyed a real bumper crop that has made the league wonderfully exciting to follow. Sadly, we are losing the fifth-year kids and that means the quality of the OUA league and game will dip. Granted, there is hope in Sinopoli, Quinlan, and maybe Luke Thompson but this period will always be regarded as a special era in the OUA. No, thank you for commenting. And watch out for Jason Schuler at Western in a couple years' time. Conference awards are based on regular season only and national awards are voted on the week of the conference finals, so playoff performances are moot in the eyes of the voters. It's an entirely contestible concept that "conference awards are based on the regular season only." Keeping it that way based on "tradition" is silly, frankly. You have to give fans something new. Let's generate a list of 10 starting the week of the semis in all four conferences, then announce three finalists before the bowls and present the Hec at the Vanier Cup. Have every conference have polls on their website. It would be fun. Playoff games are most vital to a team's season since it determines how long it keeps playing, especially in football where playoffs can make up a third of the season (4 of 12, 5 of 13 in the OUA). Leaving that out of the equation in football is assbackwards. It's fine in baseball where they have 162 games and only a small percentage of teams make the playoffs. There's a month left in the football season, five more Saturdays. How can they really cut people out of the debate. Canadian Interuniversity Sport is constantly trying to find ways to have more a footprint in Canada's sporting culture, but hey, let's just stick with what we've done for 40 flippin' years. Well written as always, Naete. I firmly believe that these two are the two best in the CIS this year. It's a shame the OUA MOP will be the real contest this year. After today's game, is there even a question as to who should be the winner of this trophy? Mike Faulds, hands down. He is a unique human being. An incredible young man. Michael Faulds hands down. The QB with the most heart by far!!! Mike Faulds!!! he deserves it so much, and the way he steps up and leads his team is remarkable. Mike Faulds is a warrior! Playing on one knee as he has done for so long and never complaining. What a game between two great teams. Only thing disappointing for me was the call on the touchdown pass that was called a reception at the 1 yard line. The TV replay showed it as a touchdown in my opinion. Mike Faulds however didn't complain just kept on playing. A true hero of excellent character. MIKE FAULDS, he isn't just an amazing leader on the field but off the field as well, the kind of courage he has shown especially in this last year is just incredible. A man who has a heart of a LION is no other than MICHAEL FAULDS. I've seen a lot of great Western quarter backs over the years, from Cosentino to Bone to Gaffney to Hessel and on and on and I've seen many of this era's great QB's, Brannigan, Chapdelaine, Groulx, Sacobie. But what Michael has done to lead this team this year, the latter part of the season on one leg, is nothing short of miraculous. I know that every member of the Stangs would acknowledge that he is by far and away their most valuable teammateand their leader. He is a warrior's warrior. He deserves the Hec. Western's last few minutes in the game against the Gael's played out like a movie. Michael Faulds brought tears to plenty of eyes with his true grit and determination. That passion he has exuded throughout his career has made him an incredibly respected leader. He deserves the Hec!! There is no person that has dedicated more to his team then Michael Faulds. He absolutely deserves this award because he is the most valuable player any team could have. 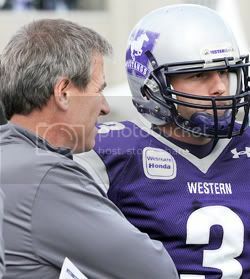 He has more heart then anyone i have ever seen and when people refer to his last game to show how much heart he has, well thats great, but if you played with him you would know hundreds more times where this guy proved his dedication to the western mustangs. Hands down greatest player in the cis.